Google Chrome seems ubiquitous these days, thanks to its robust set of features. Its vast collection of extensions The Best Chrome Extensions The Best Chrome Extensions A list of only the best extensions for Google Chrome, including suggestions from our readers. Read More and its sheer simplicity make it really hard to give up on Chrome. Though, it has its own share of problems like being heavy on system resources and draining battery life. What if you could switch to a different lightweight browser? And retain the technology that runs Chrome? Chromium is the open-source browser project behind Chrome. A lot of developers have forked Chromium to include unique features around privacy, multi-media, and security. More importantly, most of these browsers support Chrome extensions so you get the best of both worlds. Vivaldi is the brainchild of Opera’s former CEO, who wasn’t happy with the direction Opera was headed. It aims to target power users while bringing back discarded features from Opera. Such functionality offers real advantages for students 7 Ways the Vivaldi Browser Helps Students Get Better Grades 7 Ways the Vivaldi Browser Helps Students Get Better Grades Can your browser make you a better student? The Vivaldi browser may just make you think so with its features. Read More , to name one demographic. Vivaldi’s user interface sports a color scheme that changes based on the current webpage. It offers the ability to change themes, position tabs, and supports many other customization options. Vivaldi is built using the Chromium web browser project, so extensions available in the Chrome Web Store can also be installed in Vivaldi. It lets you annotate web pages and supports mouse gestures for faster navigation. But perhaps the feature Chrome users would be most interested in is the Tab Hibernation feature. It lets you hibernate tabs and free resources when those tabs are not actively used. Platforms: Available as a free download for Windows, Mac, and Linux. Opera has been around for more than a couple of decades and has pioneered a lot of features like the Speed Dial, tabbed browsing and private browsing. In 2013, Opera decided to discard its own Presto engine in favor of Blink, a browser engine developed as a part of Chromium project. Opera is power-packed with features 8 Opera Features You Should Start Using Today 8 Opera Features You Should Start Using Today Let's explore eight of the best Opera features that will make browsing smoother and more convenient for you. We bet you'll want to start using them right away. Read More . Along with the usual features, it comes with a Turbo mode. When enabled, it compresses web pages, thus making them load faster by up to 50%. This can be particularly helpful if you’re trying to save data or you’re browsing the web on a slow network. Another relatively new addition is the integration of a free VPN service right into the browser. This lets users access blocked websites and also helps users stay secure on a public network. If you’re switching from Chrome, you can use the Download Chrome Extension extension. It lets you install extensions from Google Chrome Web Store directly in Opera. (Note that it doesn’t support Chrome themes as of now.) Begin with these Chrome extensions that will make Opera even better! Platforms: Available as a free download for Windows, Mac, Linux, iOS, and Android. Earlier this year, Opera launched an experimental new web browser Opera Neon Reveals the Future of Web Browsers Opera Neon Reveals the Future of Web Browsers Opera has launched a brand new web browser called Opera Neon. This is a concept web browser designed to offer a tantalizing glimpse at the future. Read More based on Blink. It’s a radical re-imagining of what web-browsers of the future should look like. The futurism is pretty evident from the fact that the first time you launch it, you are greeted with a background that blends in beautifully with your desktop wallpaper. The tabs are represented by vertically-stacked circles instead of the usual rectangular tab-bar. Besides the cosmetic changes, it comes with some great usability features, too. It features split-screen mode and a built-in screen capture tool. Opera Neon puts special emphasis on multimedia-related features. The currently playing media can be controlled from a unified place. The Video Pop-out feature lets you pop-out a video, letting you browse other websites while watching videos simultaneously. Note that Opera deliberately hasn’t included support for extensions, as it says that Neon is a concept web browser for now. Initially released in 2012, the Blink-based browser has amassed a lot of popularity owing to its security-related features. While it’s far from the most visually appealing web browser, it makes up when it comes to usability and security features. The security system scans files and websites for viruses and blocks fraudulent websites. Yandex also comes with support for DNSCrypt technology, which encrypts DNS traffic between user’s computer and name servers. It automatically encrypts the traffic when you connect to an open WiFi network. The browser also uses Opera’s Turbo technology to load web pages faster. The Yandex browser allows installation of extensions only from Chrome Web Store and Opera Add-ons, where they are tested for safety. Brave is a new open-source web-browser by the co-founders of the Mozilla project. The founders describe it as a “browser with the user’s interests at heart.” It accomplishes this by blocking website trackers and removing intrusive advertisements. But wait, ads help publishers pay their bills Are Ad Blocking Browser Extensions Killing The Internet? Are Ad Blocking Browser Extensions Killing The Internet? One of the reasons for the Internet’s surge in popularity is the cost of most online content – or rather, the lack of cost. That’s not to say the content is free, however. Almost every... Read More and blocking them seems ethically wrong? True. Fortunately, Brave blocks ads but also comes with an alternative model: Brave Payments. It lets you load your virtual wallet with a few dollars and set up microtransactions. It keeps a track of websites where ads are blocked and then pays those websites every month using the money in your virtual wallet. The only major downside is that it doesn’t support extensions. If ad-blocking and password management extensions are all you need, it has you covered. But if you rely on Chrome extensions to stay productive, you’ll have to give this one a pass. 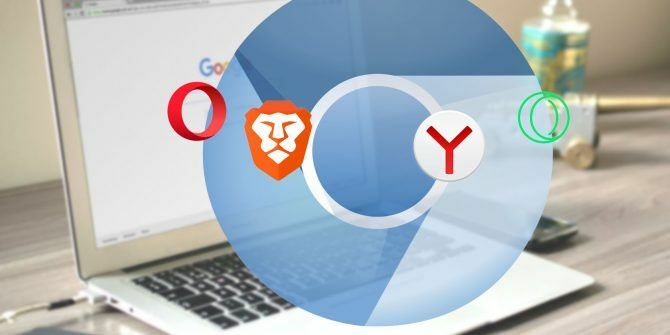 Here are a few Chromium-based browsers that lay special emphasis on protecting the privacy of the users and helping them stay secure while browsing the internet. Epic is a privacy-centered web browser. It is always in a “Private browsing” mode, and proactively removes cookies, browser history, and cache upon exit. It also disables other data that is sent to Google, like address bar suggestions. Platforms: Available as a free download for Windows and Mac. SRWare Iron is another privacy-focused browser that aims to eliminate privacy-compromising functionality from Google Chrome. To accomplish this, it takes a different approach: instead of adding new features, it actually strips down potentially privacy-related functionality from Chrome. It removes Google-hosted error pages, Google Updater, DNS pre-fetching, address bar suggestions, etc. Platforms: Available as a free download for Windows, Mac, Linux, and Android. Similar to SRWare Iron, the Comodo Dragon browser disables the privacy-compromising functionality in Chrome. It removes address bar suggestions, bug tracking system, and Google user tracking. The built-in PDF viewer, Google Safe Browsing, and Google Translate also get the boot. It lets users configure their computers to use Comodo’s DNS servers, which performs additional checks to verify the security of websites. Platforms: Available as a free download for Windows. Torch browser puts heavy emphasis on multimedia-related features. It has a built-in Media Grabber that lets you save audio and video files from the internet. Torch Player lets you play videos before they have finished downloading. It also features a built-in torrent client, making it easy to manage torrents straight inside the browser. Platforms: Torch browser is available as a free download for Windows. Whether you’re looking to enhance your privacy or you’re looking for a fresh new design, there’s a Chromium-based browser for you out there. The only major gripe with some of them is that they can take a while to update to the latest version of Chromium, which means that you could easily miss out on critical security fixes. My pick among the nine on the list? Opera, with its smart browsing features 9 Opera Browser Tips That Make Web Browsing More Fun 9 Opera Browser Tips That Make Web Browsing More Fun Opera offers much more than what meets the eye. There are a host of other nifty browsing features you probably don’t know about. Read More , and Vivaldi manage to stay neck-and-neck with Chromium updates, making them a browser of my choice. And now there’s also a Chromium-flavored Microsoft browser in the running, complete with support for Chrome extensions. You can explore the Chromium-based version of Microsoft Edge with Edge Insider Channels The New Microsoft Edge Insider Channels: All You Need to Know The New Microsoft Edge Insider Channels: All You Need to Know You can try Microsoft Edge with Microsoft Edge Insider Channels right now. What are these developmental channels all about? Read More . Explore more about: Browsing Tips, Google Chrome, Opera Browser. Its full of malware, and its hard to get rid of. It will associate itself with everything possible (media files, magnet links) and embeds itself so you cant choose other programs. Plase listen to my advice, or at least get some more info on Torch before you install it. Vivaldi for me. Opera was my browser of choice until they changed it, then Firefox, until they modified it, so I switched to Vivaldi and I've been a happy bugger since. Vivaldi is the new opera. Mozilla and Google showed some 1984 moves and political abuse, that made me distrust them as a company, so those two along with any ms browsers and Chinese products are on my blacklist. And I don't care if edge or whatever they call it is good. After ie ms browsers will never be touched. I switched to Vivaldi full time a couple months before Firefox Quantum came out because Firefox was getting to be so unbearably slow. Now that Quantum is out, I've played with it and customized it a bit, but I still don't have any great urge to go back to it full time. Think I may just stick with Vivaldi. I've been tired of ff being broken and slow all the time, then less and less addons kept getting support. Now I've got all I needed from opera, chrome and ff in one place. try centbrowser.com...love the way its continuously developed. Are we trusting both chinese Opera and russian Yandex? Maybe for watching cats in youtube (without google log-in), but not email, and certainly not banking or buying. Yep, wouldn't trust Google either after recent socjus crusades, nor Mozilla which also has similar history. At least Google is american, and more or less open with their data collecting and what they use it for (mainly to be sold for targeted advertisement, which can be argued that ultimately benefit not only Google adn advertisers but also the user). Not so with russian or chinese browsers, AFAIK. I feel that Chrome and Firefox (and a few others) are the right amount of tinfoil between trusting a russian browser and a not setting for less than a browser written by oneself. Its not a feature, its a catastrophe. "At least Google is american..."? Did you miss the summer of 2013? Snowden. Do you believe that PRISM doesn't exist? What about National Security Letters? Don't you realize how weak the privacy protection laws are in the USA compared to some other countries on the other side of the Atlantic? Haven't you been following the IT news regarding how intrusive Chrome is/can be? It's tougher to find working alternatives for all of our compromised hardware than for data-grabbing software. Seriously, reconsider. Opera is Norwegian. Thus, sure, one should trust a EU-based company much more than a US one. It happens to have secondary offices in China and other places, but so do many US companies. And "Firefox Chromium" - the "new" browser that allegedly uses less memory but in practice is fatter and slower than bog-standard Firefox. That was the last straw for Mozilla! Opera? Never. Opera is Chinese nowadays. So are most probably most of the things you use nowadays, so what? Different animals. If you are using a hammer made in China, worst thing that can happen is it breaks easily. But if you are using a software developed in China or by Chinese, you can't guarantee whether there is a backdoor in the software that connects back to its server in China. There is a rumor that Huawei cell phone has a backdoor in its firmware that collects info and sends back to Huawei server. So stay away from Chinese software if you can. What is the worst thing they can do with that info that Google can't or won't when you use their stuff? Which by the I am on a daily basis. I dunno, but do you trust your bank, money, personal data to people who seem to have conning in their dna, have absolutely no respect for human life or care about the quality of their products? I have nothing against Chinese. .. aside from the fact I have 0 trust towards them. Well, if being cunning is something genetically related so that must touch all of Homo Sapiens as an animal species. Without personal prejudice towards one or other members of the human race, when 90% of data communication passes through a few companies based mainly in the USA, the question of who can/will collect your personal info is not that hard to answer. Love Vivaldi, have been using it on Xubuntu 16.04 for months now. Tried Brave, it was...lacking.